Nothing can beat the aroma and flavor of an authentic homemade tortilla.There's just something about the delicious scent that emanates fromit, including its texture and taste that is incomparable to storebought tortillas. Now you can make your own with a pack that offersyou all the essentials you need. So get your kitchen and comal readyto create incredibly tasting tortillas, just like the ones your momand grandmother used to make. Tortilla Essentials Making Gift Pack 3 items. 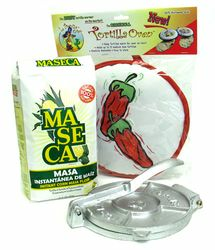 A pack of gluten free Maseca Corn Flour for tortillas is included, approximately 4.4lbs. So you can make great tasting tortillas, but don't stop there since you can also prepare the dough for some delicious guaraches, sopes, pupusas and empanadas. With the enclosed cast iron Tortilla Press you'll be able to shape and press your balls of �Maseca� dough into perfectly thin and round tortillas. The last item in the �Essentials for Tortilla Making Gift Pack� is the Tortilla Warmerby �La Tortilla Oven�, which every tortilla lover must own! Keeps your tortillas warm, soft and fresh. This gift pack is a must have and makes an excellent gift for any tortilla lover! Nada puede superar el aroma y el sabor de la autentica tortilla casera.Hay algo en su delicioso olor que lo hace unico, incluyendo sutextura y sabor que es incomparable. Ahora tu tambien las podrashacer con un paquete que te ofrece todos lo necesario para lograrlo.As� que prepara tu comal y cocina para crear tortillas increibles,al igual que las de tu mama y abuela. El Paquete de Regalo y Esencial para hacer tortilas, 3 articulosincluidos. Incluye un paquete de Harina de Maiz Maseca sin gluten, para tortillas, aproximadamente de 4.4 lbs. Asi podras hacer tortillas con gran sabor, pero no pares ahi ya que tambien puedes preparar la masa para crear unos deliciosos sopes, guaraches, pupusas y empanadas. Una Prensa Para Tortillas de hierro fundido, para apachurrar y darle forma a las bolas de masa �Maseca� y asi hacer unas tortillas perfectamente delgadas y redondas. El ultimo articulo en el �Paquete Esencial Para Hacer Tortillas� es un Tortillerode la marca �La Tortilla Oven�. Este mantendra tus tortillas calientes, suaves y frescas. Este paquete de regalo es perfecto para todo aquel que es amante de las tortillas! Once you make your own tortillas you can never eat anything out of a box. The press is well made and easy to use. The Masa makes a tortilla that is an experience to eat, soft, warm and full of flavor. The tortilla warmer looks great on the table but serves its purpose to keep the tortillas warm during dinner.